IKV now has a new all-electric injection moulding machine of Type ENGEL e-motion 440/160. 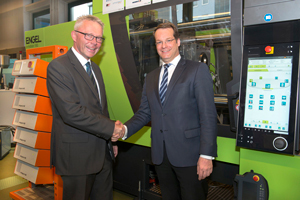 Rolf Saß, Managing Director of ENGEL Deutschland GmbH, handed over the machine to IKV. The new all-electric toggle clamp injection moulding machine is specifically geared to the production of optical components. The new all-electric toggle clamp injection moulding machine is specifically geared to the production of optical components. It offers the possibility of examining high-precision injection moulding and injection-compression moulding techniques. The machine has a clamping force of 1600 kN and is equipped with a 35 mm screw specially coated fortransparent plastics. IKV's research program includes a number of innovative approaches for the process control to the multi-layer building of thick-walled optics with the aim of enhancing the precision of optical components and shortening the cycle time. The general objective of the research work at IKV is to examine the process-related and mould-related challenges in the production of complex, high-precision optical components. 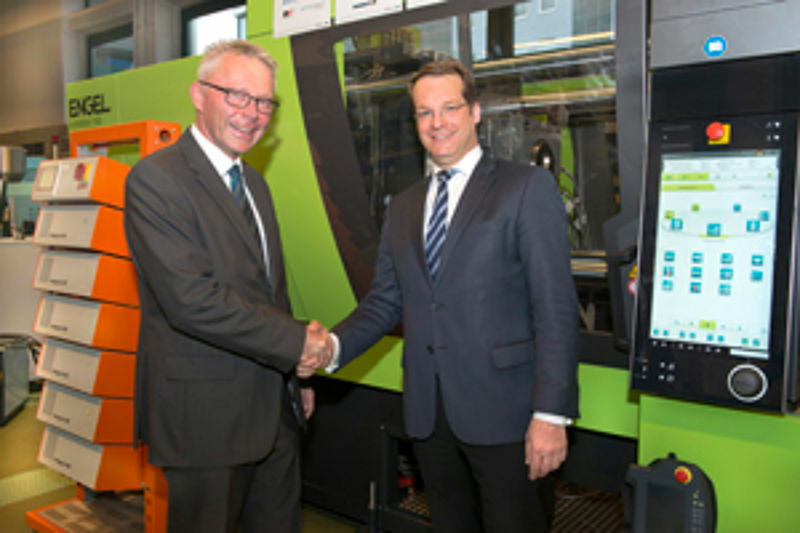 The head of the Institute, Professor Christian Hopmann, thanked Engel for providing IKV with the state-of-the-art injection moulding machine: "We are delighted that we are now in a position with this machine to further expand our activities in the injection moulding of optical components. ENGEL has been supporting this work for some time now and, with the new injection moulding machine, will enable research to be carried out with the latest technology. In matters of efficiency and precision, this is an important step forward for our work," he said.